Daniel Laflamme grabs a water bottle with his foot and bends over to take a sip. Then he adroitly places a paintbrush between his toes and begins to paint. 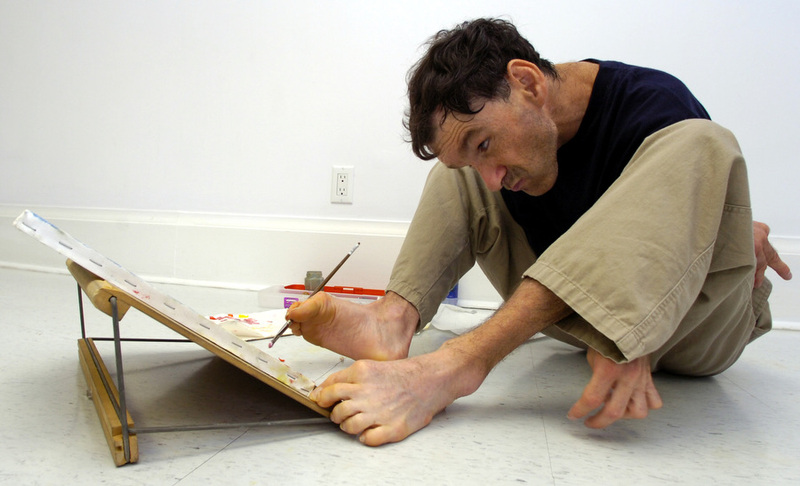 Deaf and mute, Laflamme, who has cerebral palsy, communicates through his painting. In 2006, the Quebec City artist was in Toronto to help publicize an exhibition by Canada’s Mouth and Foot Painting Artists. The organization sells replicas of the painters’ works on greeting cards and calendars to help the artists live independent lives. At the organization’s headquarters on St. Clair Avenue West, Laflamme showed off his prowess as an artist. Bent over like a pretzel on the floor, he painted with authority and skill as he worked on a still life of flowers and a fruit bowl. Then he stopped to get more paint. He used one foot to bring the palette of paints closer to him. Holding his paintbrush between his toes, he dipped his brush in the paint and then began once more to delicately apply color to his masterpiece. This entry was posted in Uncategorized and tagged ability vs. disability, art exhibition, artistic ability, artistic skill, calendars, Canada, Canada’s Mouth and Foot Painting Artists, cerebral palsy, communication, creativity, Daniel Laflamme – foot artist, deafness, Debra Black - reporter, disability, feet, foot artist, Foot Painting Artists, greeting cards, human rights, immobility, living independently, mobility, Mouth and Foot Painting Artists, muteness, paintbrush, painting, painting with feet, palette of paints, Quebec City artist, Rick Eglinton- photographer, still life art, talent, Toronto, Toronto Star. Bookmark the permalink.